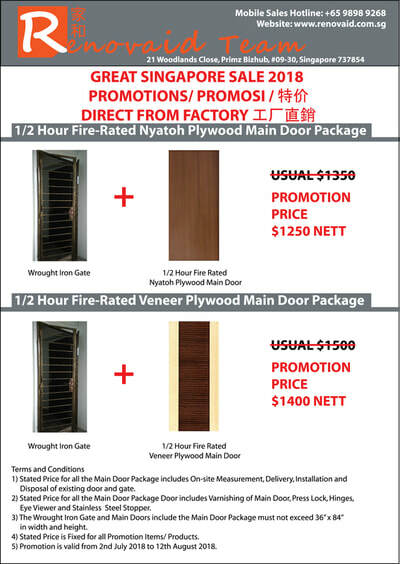 Renovaid Team - The Home Improvement Team offered Aluminium Grilles, Aluminium Bifold Door, Aluminium Sliding Window, Wooden Doors for Main Entrance and Bedroom, Wrought Iron Gate, Wrought Iron Grille, Carpentry Work, Electrical and Plumbing Work, Painting and Tiling Service to direct BTO and Resale Flat all home owners in Singapore at direct factory price. We try to make your Renovation and Home Improvement affordable and available to all. 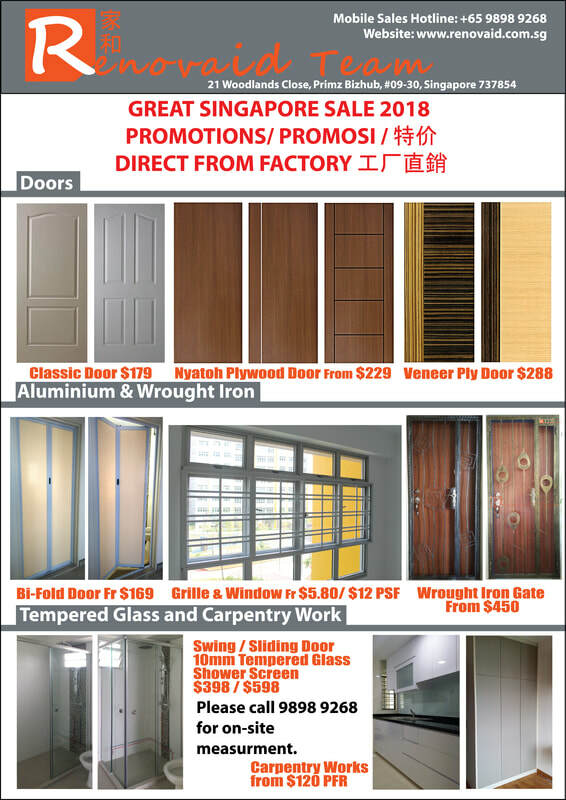 No matter how big or small scale the job or task, Renovaid Team will be most willing and keen to undertake. 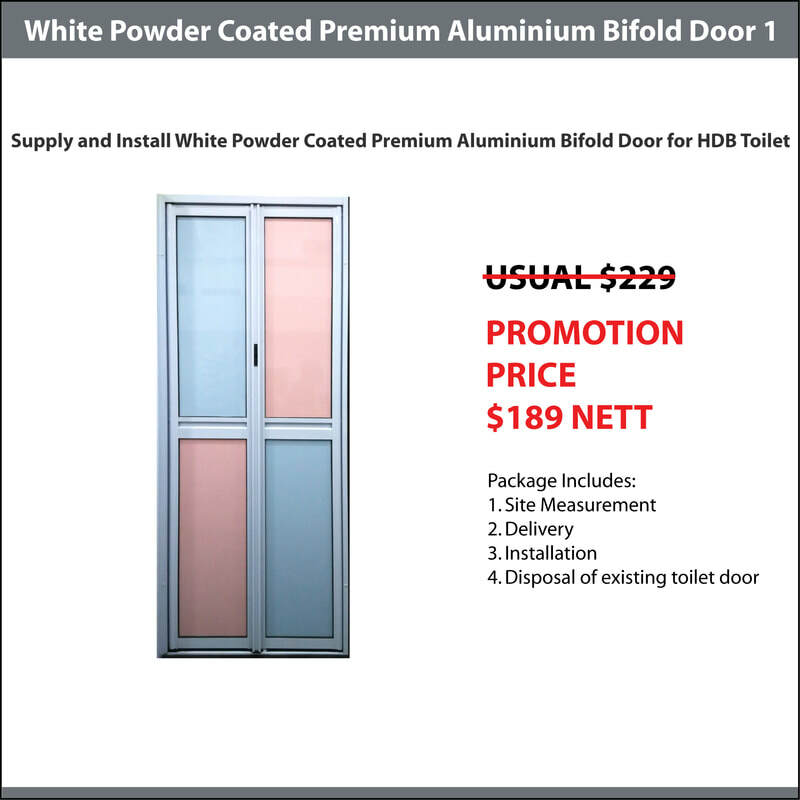 Should you have any questions in our products or need immediate quotations, feel free to Call our Mobile Sales at 9898 9268 who will be able to assist you immediately. 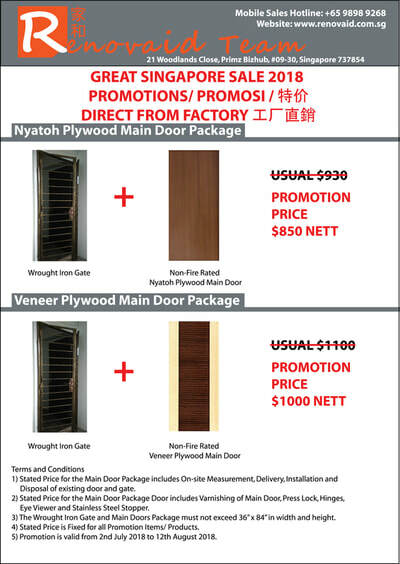 Our Friendly mobile Sales are also all over Singapore to serve you well and almost immediate* measurement. 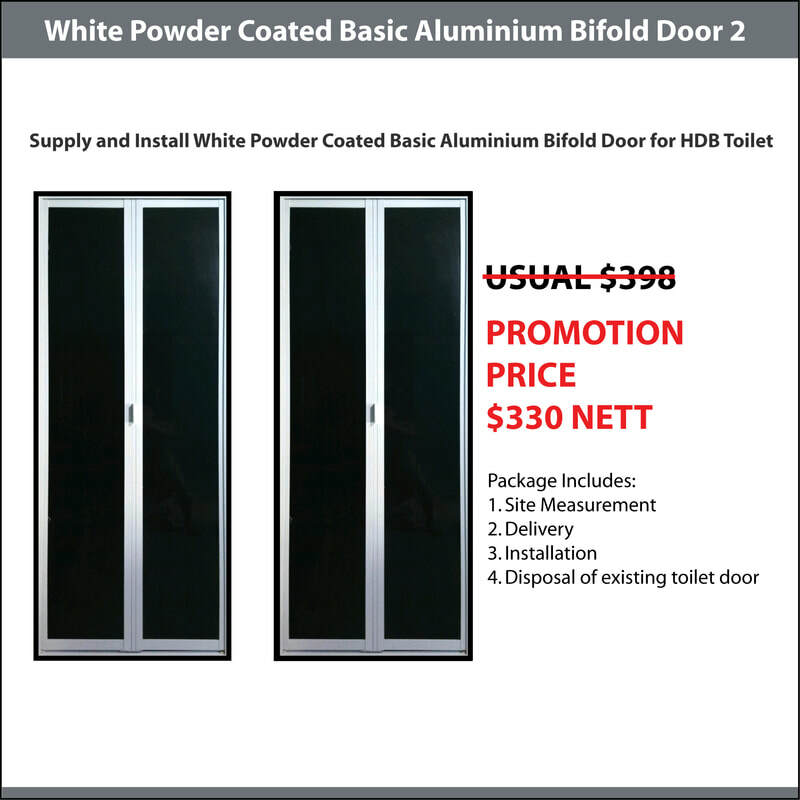 A Set of White Powder Coated Basic Aluminium Bi-fold door (2 Sections) including frame not exceeding 36" x 84". 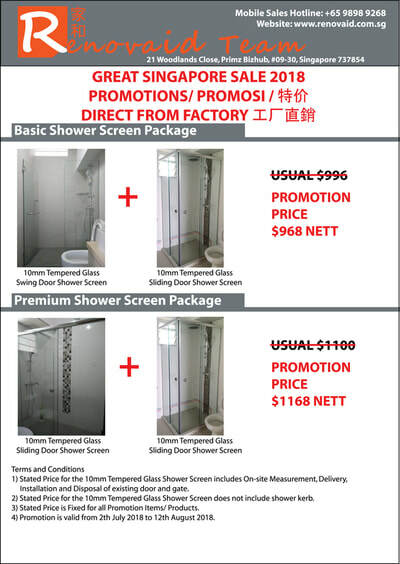 On-Site Measurement by our Mobile Sales. Delivery and Installation by our in-house installer. 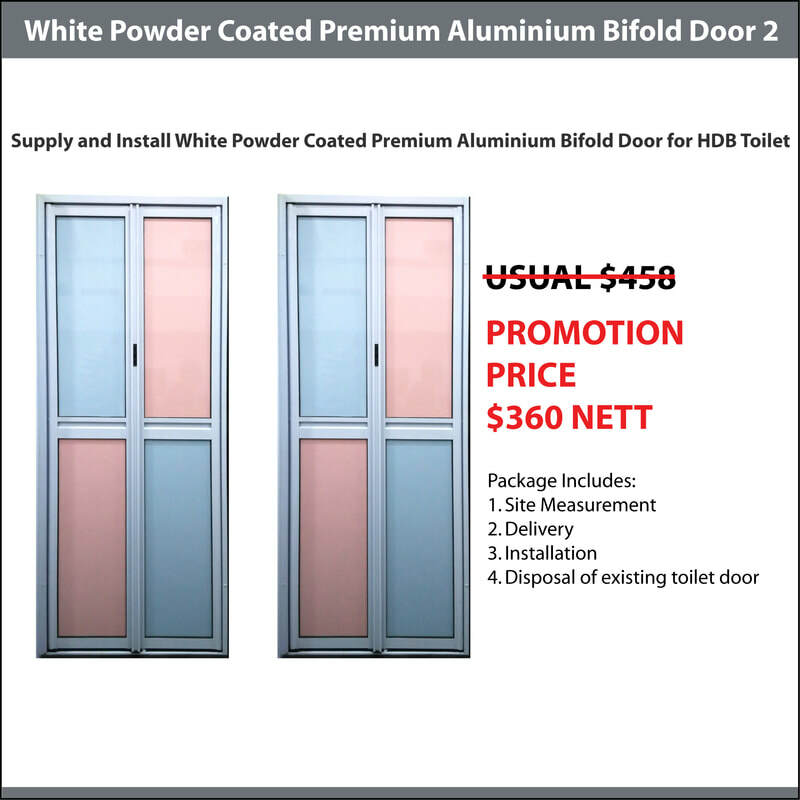 Disposal of existing toilet door (Aluminium bifold/ PVC bifold/ Wooden swing door). 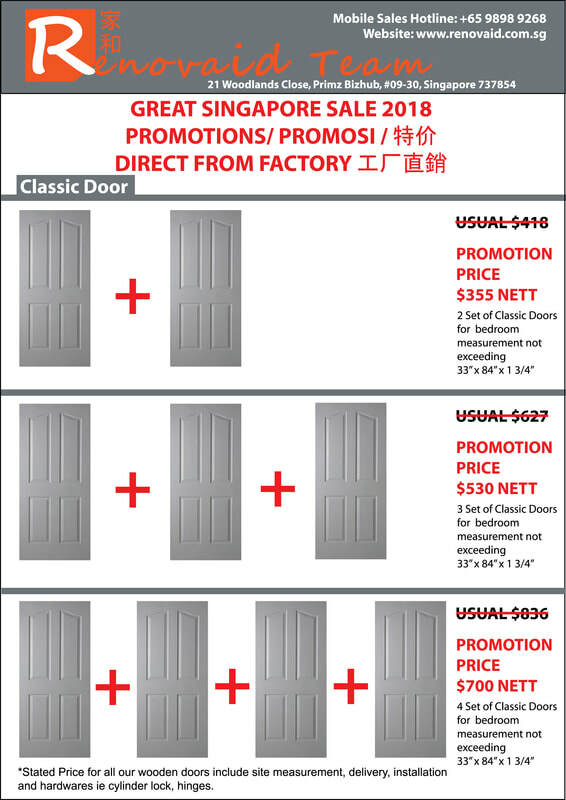 A Set of White Powder Coated Premium Aluminium Bi-fold door (4 Sections) including frame not exceeding 36" x 84". 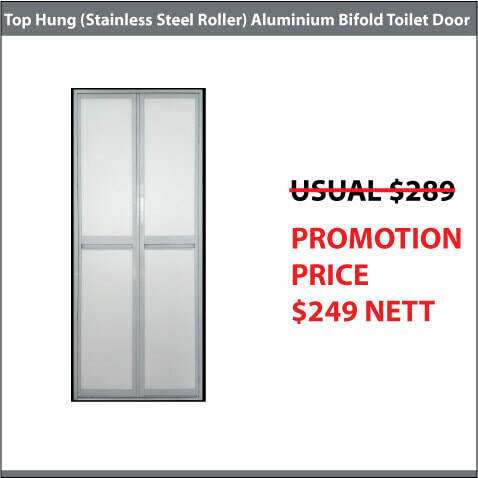 A Set of Top Hung (Heavy Duty Stainless Steel) Aluminium Bi-fold door (4 Sections) including frame not exceeding 36" x 84". 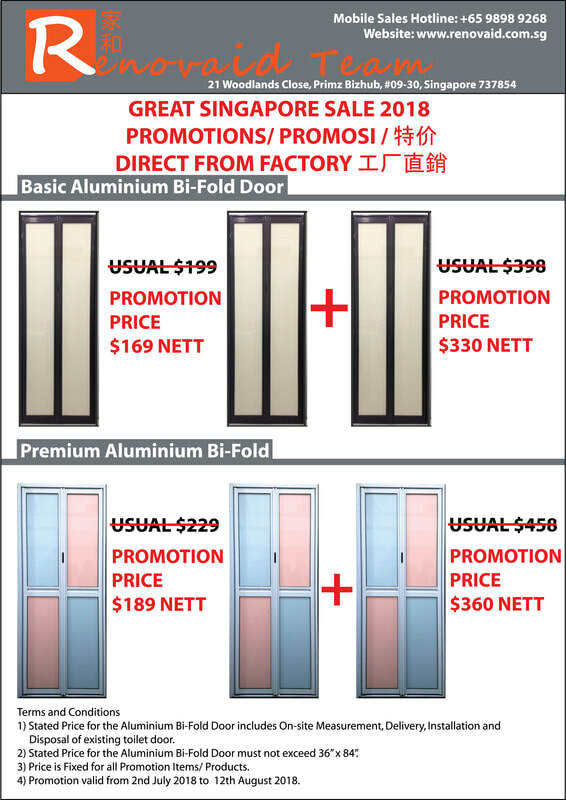 2 Set of White Powder Coated Premium Aluminium Bi-fold door (2 Sections) including frame not exceeding 36" x 84". 2 Set of White Powder Coated Premium Aluminium Bi-fold door (4 Sections) including frame not exceeding 36" x 84". 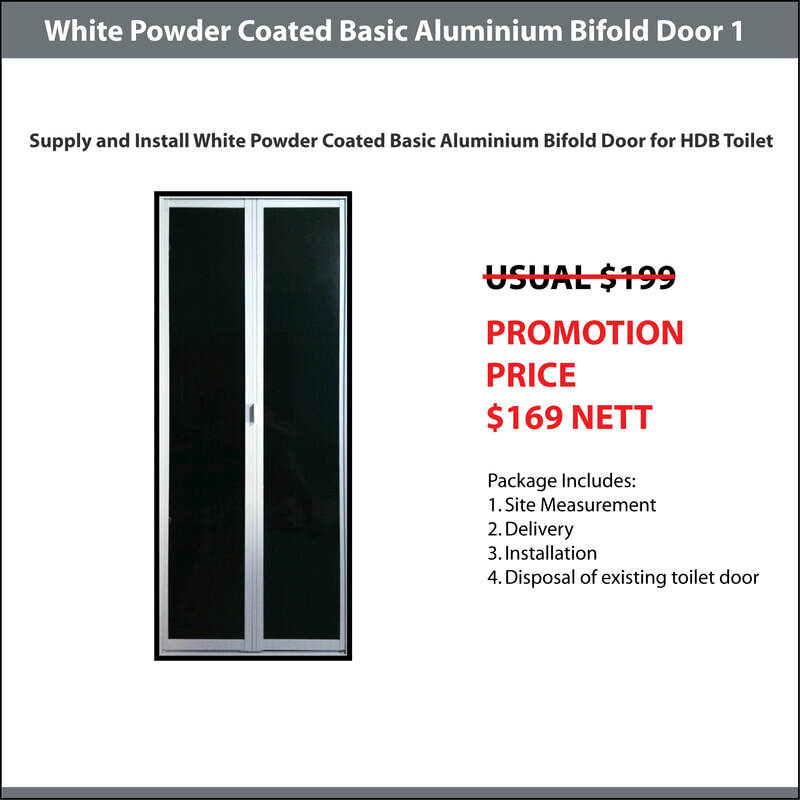 1 Set of White Powder Coated Aluminium Slide and Swing Door including frame not exceeding 36" x 84". 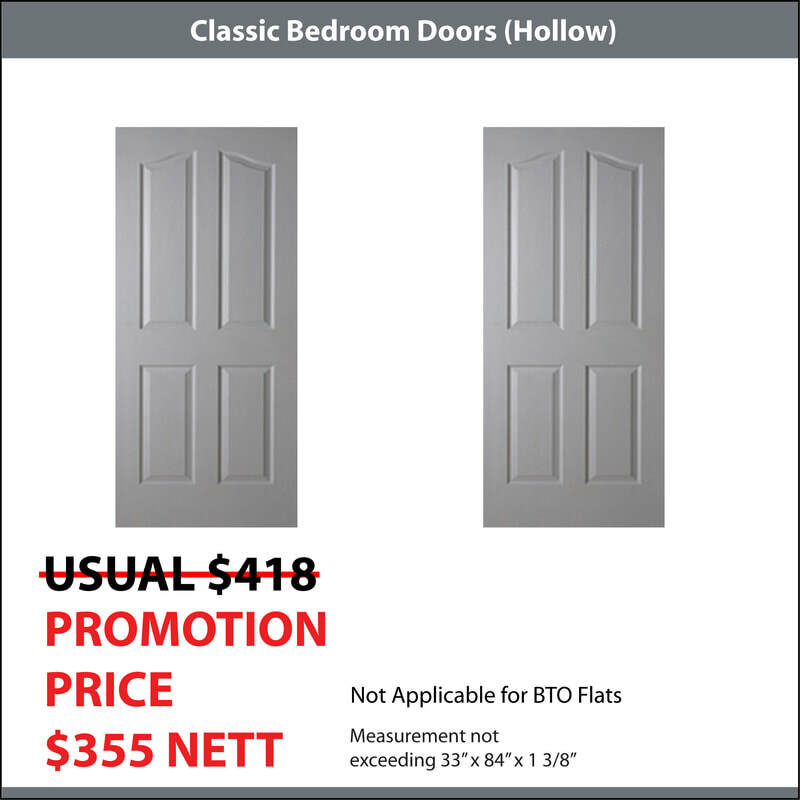 2 Set of Classic Doors (Hollow) for Bedroom not exceeding 33" x 84". 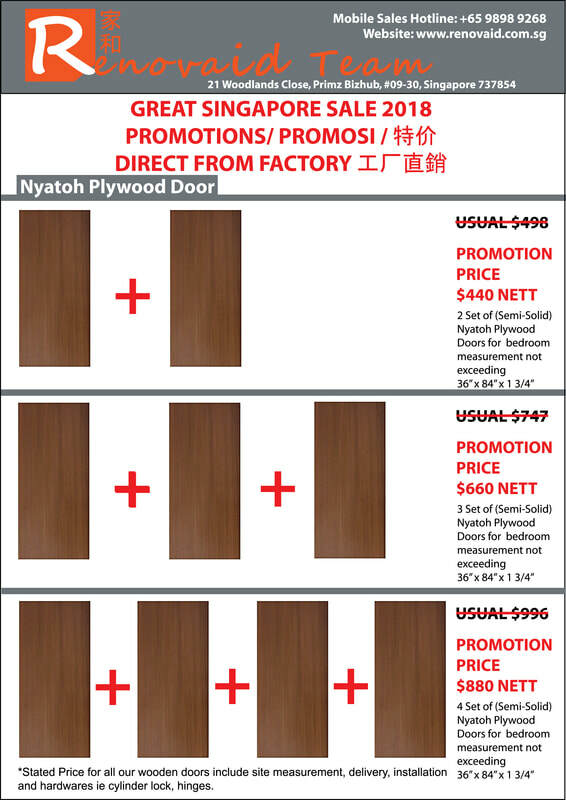 ​On-Site Measurement by our Mobile Sales. Painting of Doors (Variety of Colour Selection). Include Hardwares - Hinges, Cylinder lock and PVC Stopper. 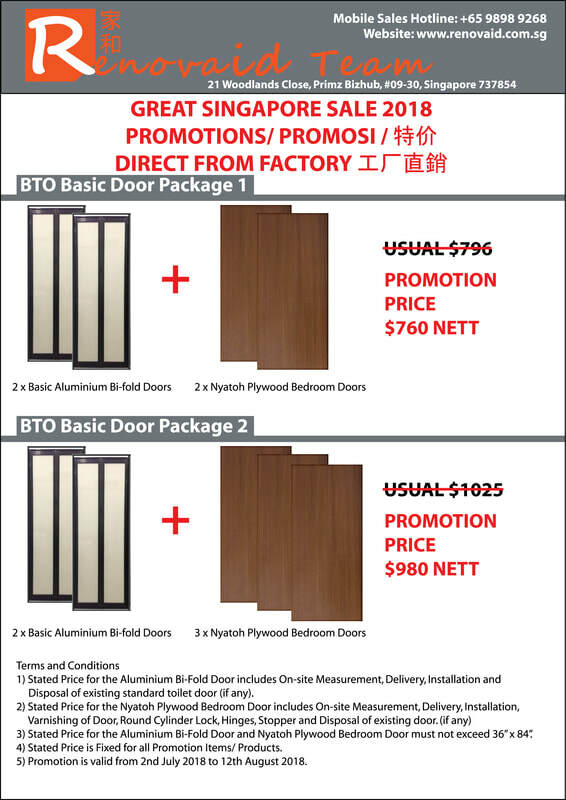 Disposal of existing bedroom doors. 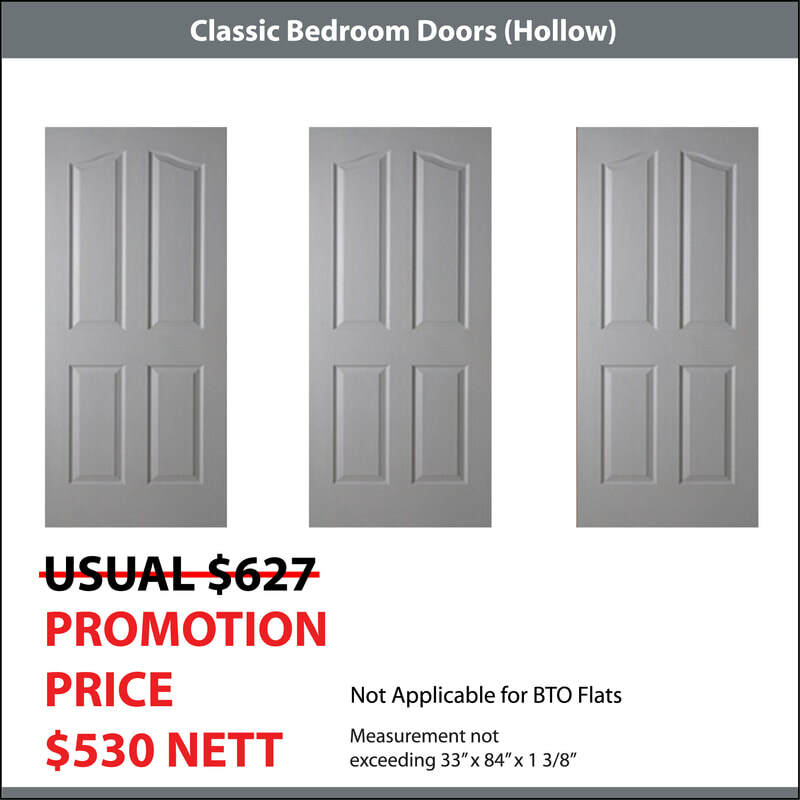 3 Set of Classic Doors (Hollow) for Bedroom not exceeding 33" x 84". 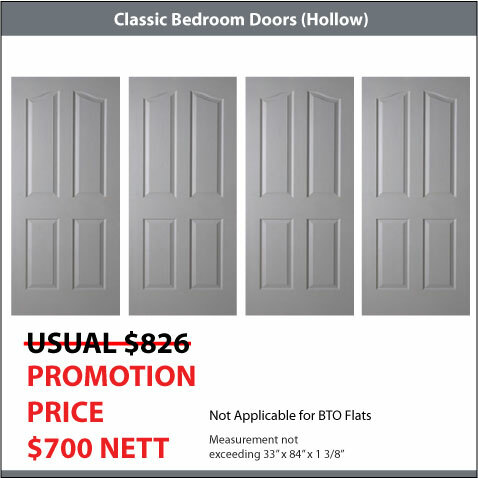 4 Set of Classic Doors (Hollow) for Bedroom not exceeding 33" x 84". 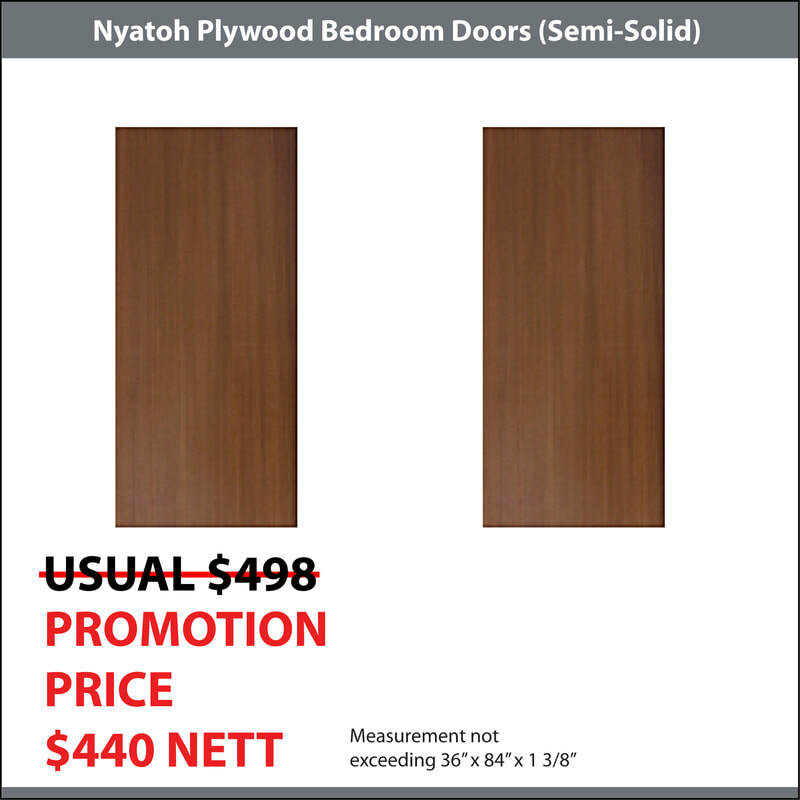 2 Set of Nyatoh Plywood Doors RT201 (Semi-Solid) for Bedroom not exceeding 36" x 84". 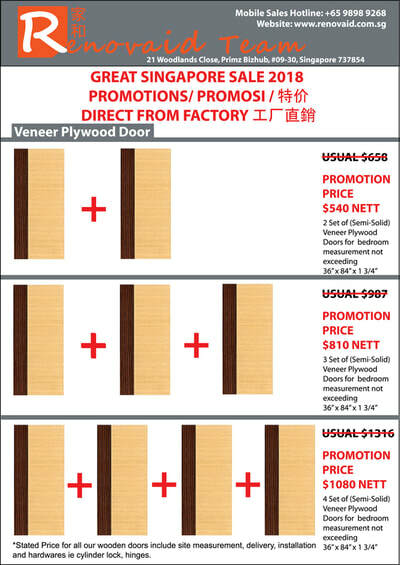 Varnishing of Doors (5 Tones). 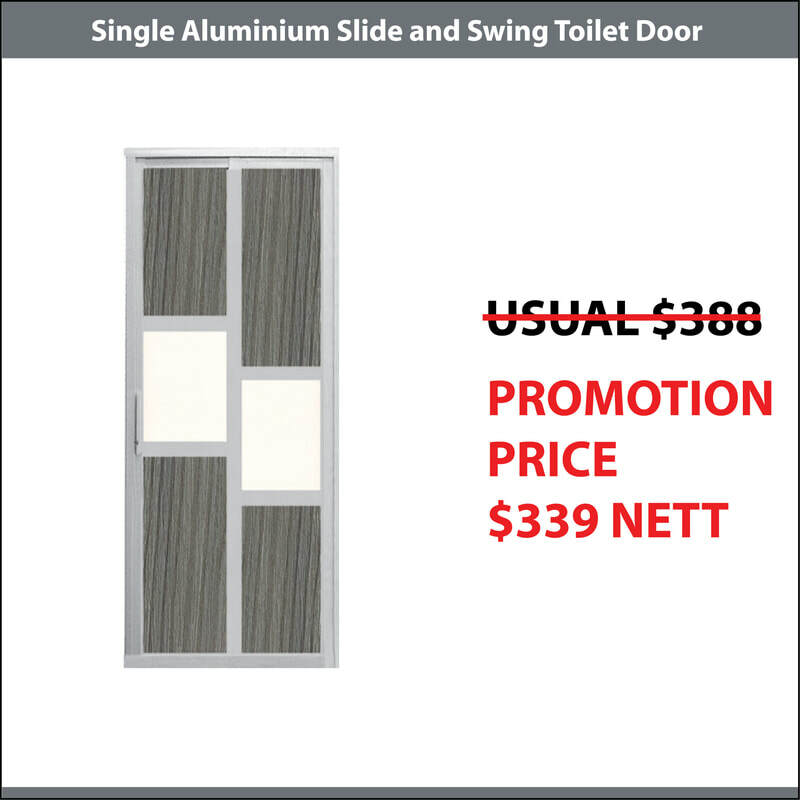 Include Hardwares - Hinges, Cylinder lock and Stainless Steel Stopper. 3 Set of Nyatoh Plywood Doors RT201 (Semi-Solid) for Bedroom not exceeding 36" x 84". 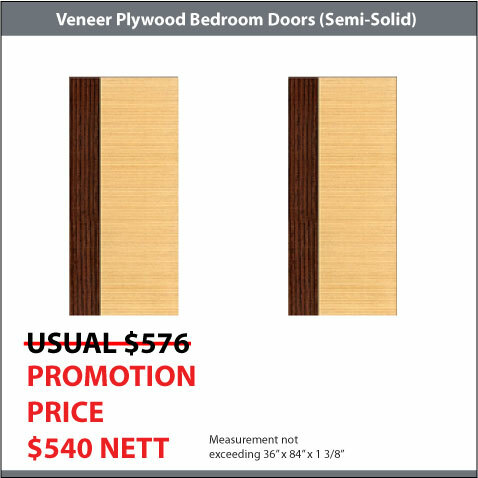 2 Set of Veneer Plywood Doors (Semi-Solid) for Bedroom not exceeding 36" x 84" with 60 design to choose. 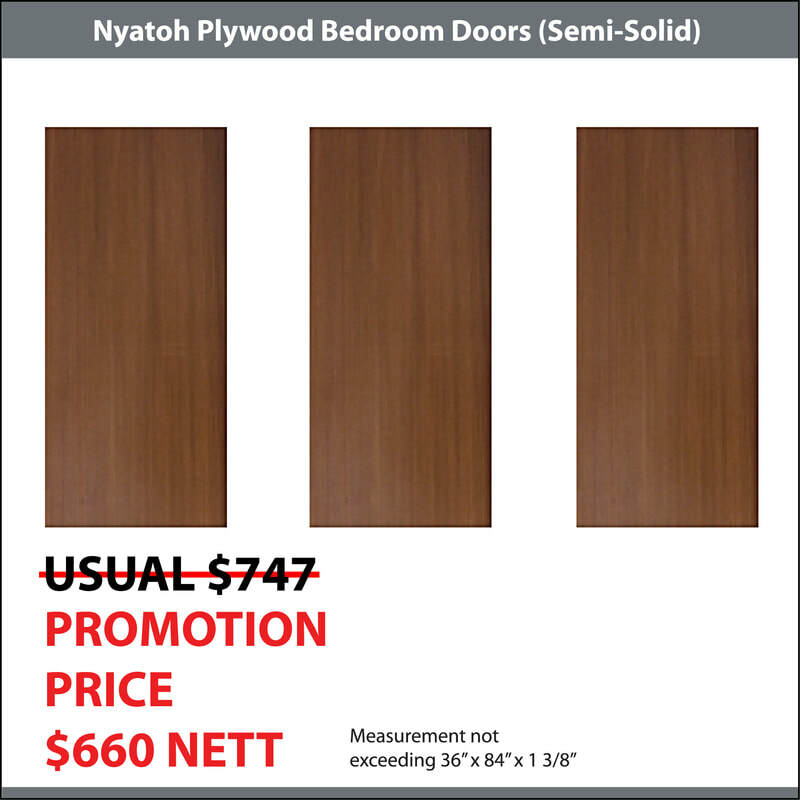 3 Set of Veneer Plywood Doors (Semi-Solid) for Bedroom not exceeding 36" x 84" with 60 design to choose. Our BTO Basic Bedroom Door and Toilet Package 1 consist of 2 set of Basic Aluminium Bifold and 2 set of Nyatoh Plywood (Semi-Solid) Bedroom Doors. 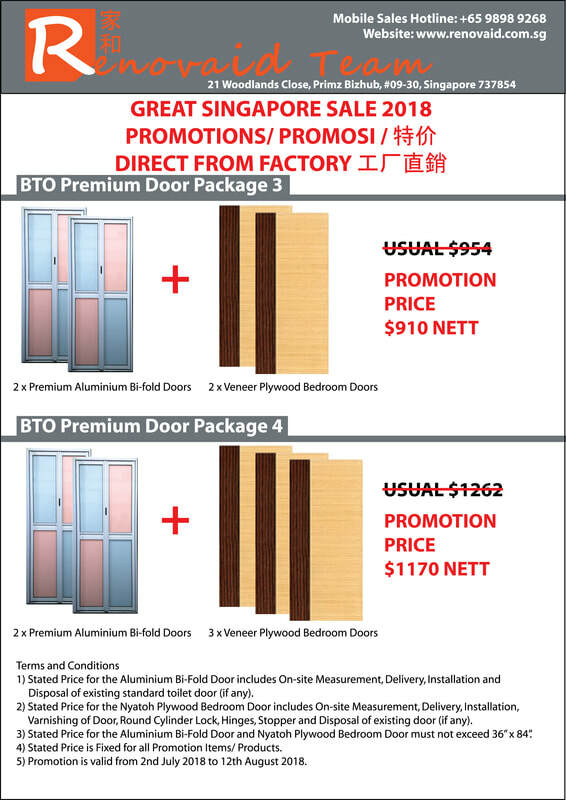 It is suitable for BTO 3 Room Flats. 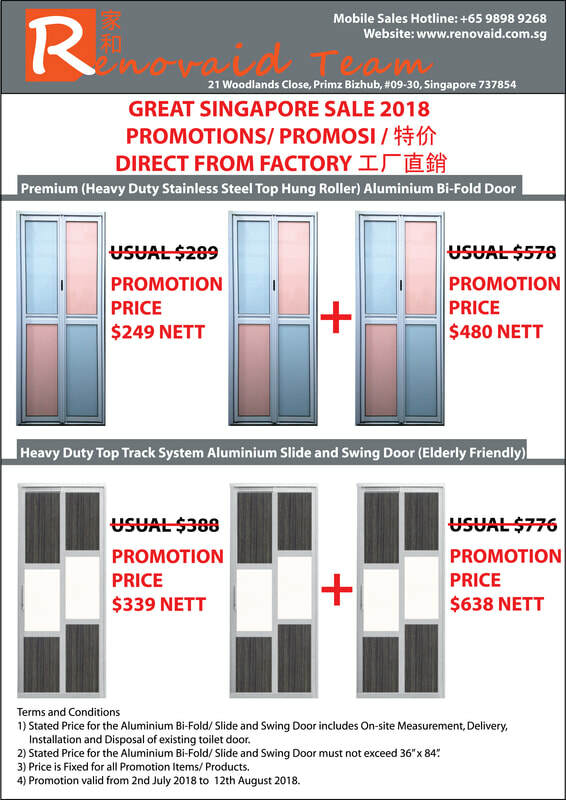 It is definitely value for money and price affordably at $760 Nett (No Other Hidden Cost).The measurement for all the aluminium and bedroom doors should not exceed 36" x 84". Our BTO Basic Bedroom Door and Toilet Package 1 consist of 2 set of Basic Aluminium Bifold and 3 set of Nyatoh Plywood (Semi-Solid) Bedroom Doors. It is suitable for BTO 4/5 Room Flats. 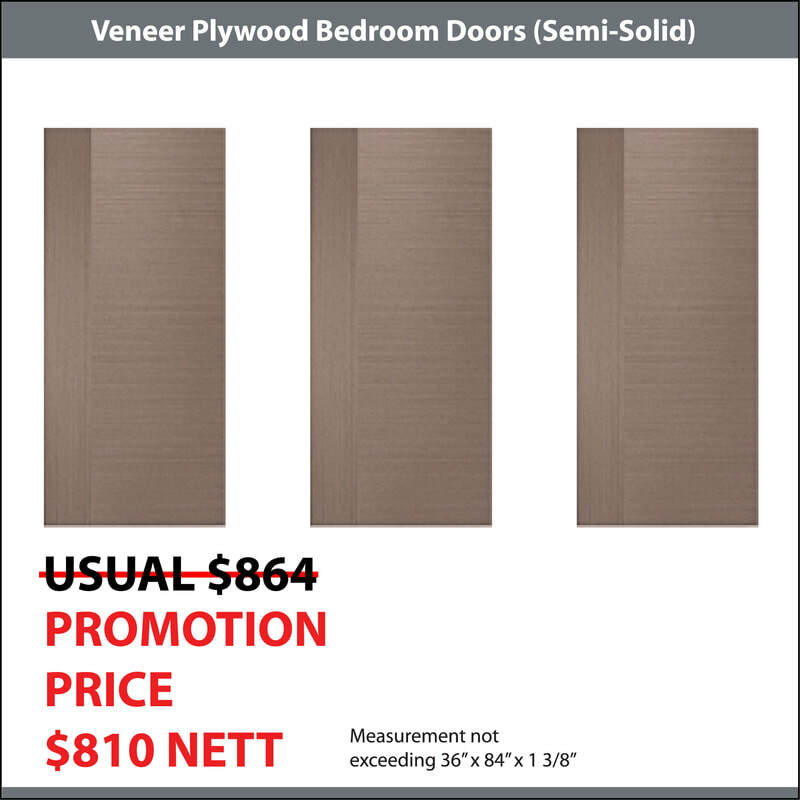 It is definitely value for money and price affordably at $980 Nett (No Other Hidden Cost).The measurement for all the aluminium and bedroom doors should not exceed 36" x 84".